St. Martin's Paperbacks, 9780312537913, 384pp. One cold night. Two shocking mysteries. In the quiet town of Grand Rapids, Minnesota, a baby vanishes from her bedroom in an opulent lakeside home. Was she abducted – or does her father have a terrible secret to hide? That same night, a young policewoman gets lost in the fog and stumbles into the middle of a horrific crime. Now a sadistic killer wants her to play his deadly game. Lieutenant Jonathan Stride and his team need to move fast to save a child and stop a vicious killing spree. As fear grips the frozen winter farm lands, Stride knows that every snow-covered field may be the next burying place. Each twist in the investigation takes Stride into an elaborate web of deceit and desire. But his biggest obstacles may be the very people he's trying to help. 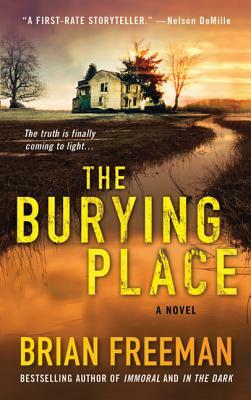 With everything at risk and time running out, Stride worries how far a desperate mother will go to rescue her baby – and how far a desperate cop will go to save herself, in Brian Freeman's thrilling The Burying Place. Brian Freeman is the internationally bestselling author of psychological suspense novels featuring detectives Jonathan Stride and Serena Dial. His books have been sold in 46 countries and 18 languages. His debut thriller, Immoral, won the Macavity Award and was a nominee for the Edgar, Dagger, Anthony, and Barry awards for best first novel. His other novels include The Bone House, The Burying Place, In the Dark, and Stalked. Brian is drawn to complex characters, and says, “My stories are about the hidden intimate motives that draw people across some terrible lines.” Brian and his wife, Marcia, have lived in Minnesota for more than twenty years.